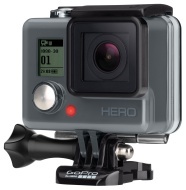 alaTest har samlet og analysert 2687 anmeldelser av GoPro Hero. Gjennomsnittlig rangering for dette produktet er 4.2/5, sammenlignet mot en gjennomsnittlig rangering på 4.1/5 for andre Videokameraer. Vi analyserte bruker- og ekspert rangeringer, produktalder og flere faktorer. Sammenligned med andre Videokameraer blir GoPro Hero tildelt en total alaScore™ på 94/100 = Utmerket kvalitet. GoPro Hero review: GoPro's new entry-level camera is positioned as travel-friendly, but it strips away one too many features. GoPro’s entry-level model strips away a few too many features to make it compelling. Affordable. Rugged, waterproof design. Touch LCD. Good digital image stabilization. Voice control. Automated editing via phone app. Wi-Fi. Limited choices for frame rates and resolutions. Can't set time-lapse interval. No ProTune, HDR, or Raw support. The GoPro Hero+ is a solid action camera if you're on a budget, but it can't be removed from its case and you can't swap its battery. Though it is nearly devoid of features, this entry point for GoPro's camera line is just enough to get you started in the world of little, mountable cameras. The GoPro Hero offers very good video quality for the money, gets you into the large mount ecosystem and the integrated housing is waterproof to 131 feet (40 meters). The camera is permanently in its polycarbonate housing; the battery is built-in; it doesn't have GoPro's port for adding a touchscreen or extra battery pack or Wi-Fi; very limited shooting options. Though the GoPro Hero is nearly devoid of features, this entry point for GoPro's lineup is just enough to get you started in the world of little, mountable cameras. In short, if you’re not bothered about extreme resolutions and technical settings, but just want a versatile action camera at a sensible price, the new GoPro might just be the Hero you’ve been waiting for. For the past few years, while GoPro was dominating the upper end of the action cam market, it sort of neglected entry-level buyers who wanted the GoPro experience, losing them to other camera makers. That changes to some extent with the Hero. The same rugged, waterproof body but with cut-down internals for a cheaper price. Is this the best GoPro yet? Find out in our 2018 GoPro Hero review. The Hero Session is GoPro's smallest action camera to date. It's also now the cheapest in the range with the £99 Hero now discontinued. Is it worth £159 though? Here's our GoPro Hero Session review.